Wilson Bowden Developments, working in partnership with Chesterfield Football Club and Tesco, have transformed the 22 acre former Dema Glass site which sits alongside the Chesterfield Ring Road. 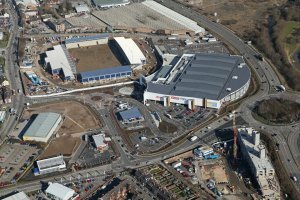 The site is now home to the Proact Stadium, Chesterfield FC‘s home ground, as well as a 12,700 square metre Tesco Superstore, a KFC drive-thru restaurant, Enterprise Car Rental and an Aldi supermarket. The site also has potential for a future park and ride service to operate from the stadium car park.